WASHINGTON, DC, November 25, 2013 (ENS) – In the first criminal enforcement of the Migratory Bird Treaty Act for unpermitted avian takings at wind power projects, Duke Energy Renewables Inc. Friday pleaded guilty in U.S. District Court in Wyoming. Under a plea agreement with the Justice Department, the company was sentenced to pay fines, restitution and community service totaling $1 million and was placed on probation for five years. During this time the company, a subsidiary of Duke Energy Corp., must implement an environmental compliance plan aimed at preventing bird deaths at the company’s four commercial wind projects in Wyoming. The company is also required to apply for an Eagle Take Permit which, if granted, will provide a framework for minimizing and mitigating the deaths of golden eagles at the wind projects. The charges stem from the discovery of 14 golden eagles and 149 other protected birds, including hawks, blackbirds, larks, wrens and sparrows by the company at its Campbell Hill and Top of the World wind projects in Converse County between 2009 and 2013. The two wind projects are made up of 176 large wind turbines sited on private agricultural land. Duke Energy Renewables was charged with failing to make all reasonable efforts to build the projects in a way that would avoid the risk of avian deaths by collision with turbine blades, despite prior warnings about this issue from the U.S. Fish and Wildlife Service. The company cooperated with the USFWS investigation and has already implemented measures aimed at minimizing avian deaths at the sites. The $400,000 fine imposed in the case will be directed to the federally-administered North American Wetlands Conservation Fund. The company will also pay $100,000 in restitution to the State of Wyoming, and perform community service by making a $160,000 payment to the congressionally-chartered National Fish and Wildlife Foundation, designated for projects aimed at preserving golden eagles and increasing the understanding of ways to minimize and monitor interactions between eagles and commercial wind power facilities, as well as enhance eagle rehabilitation and conservation efforts in Wyoming. Duke Energy Renewables is also required to contribute $340,000 to a conservation fund for the purchase of land, or conservation easements on land, in Wyoming containing high-use golden eagle habitat, which will be preserved and managed for the benefit of golden eagles. The company must implement a migratory bird compliance plan at its four commercial wind projects in Wyoming. Duke Energy Renewables said in court documents that it will spend $600,000 a year implementing the compliance plan. “This is a welcome action by DOJ and one that we have long anticipated,” said Dr. George Fenwick, president of the nonprofit American Bird Conservancy, a longtime advocate for stronger federal management of the wind industry. 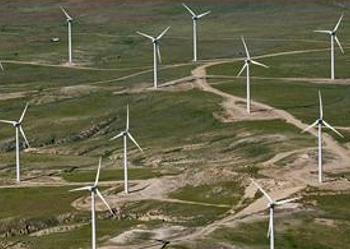 “All wind projects will kill some birds. It is sadly unavoidable, but some areas are worse than others, and we can predict where many of these will be,” said Dr. Michael Hutchins, coordinator of ABC’s National Bird Smart Wind Energy Campaign. “The problem with the Duke Energy wind facility in Wisconsin is very similar to problems that exist elsewhere. Wind farms are being built without adequate plans to mitigate and compensate for bird impacts,” said Hutchins. In 2010, the Energy Department published a renewable energy plan that called for a 12-fold increase in wind-generating capacity by the year 2030. In 2009, the wind industry was estimated to be killing about 440,000 birds. In 2012, a new estimate by Dr. Shawn Smallwood indicated it was killing closer to 600,000 birds. “Killing half a million birds by today’s wind industry is a significant figure, but how many more will be killed when the country has fully built out a program 12 times larger that operates without strong siting and operating guidelines?” asked Hutchins. BOSTON, Massachusetts, November 25, 2013 (ENS) – Taxpayer costs are rising for federal programs that provide flood insurance, crop insurance, wildfire protection and disaster relief, finds the latest report from the nonprofit business and investment leadership group Ceres. “Taxpayer costs from climate change are getting bigger and bigger. Last year’s extreme weather events alone cost every American more than $300 apiece, or $100 billion altogether – most of it to pay for federal crop, flood, wildfire and disaster relief,” said Ceres President Mindy Lubber. Some extreme weather-prone states such as Florida and Texas are also facing more acute financial exposure, the report finds. Released in October on the first anniversary of Hurricane Sandy, the report warns that losses and taxpayer costs from extreme weather events will continue to increase unless government programs are reformed to encourage less risky, more resilient practices. “Taxpayers should be outraged that their tax dollars are incentivizing high risk behavior that increases federal disaster costs,” said Steve Ellis, vice president of Taxpayers for Common Sense, told reporters. Today only about 50 percent of U.S. damages caused by extreme weather events are privately insured. “The Ceres report rightly focuses on the need for forward looking risk assessment and the use of natural barriers to reduce property loss and loss of life,” said Franklin Nutter, president of the Reinsurance Association of America. The report also documents the skyrocketing loss exposure of state-run insurance plans, especially in hurricane-prone states like Texas and Florida. It outlines steps that are needed to reform those programs, such as charging insurance premium rates that truly reflect risks and incorporating climate change risks into insurance premium rate-setting. In the past 20 years, the total loss exposure of these state-run insurance plans has risen by 1,550 percent, from about $40 billion in 1990 to over $600 billion in 2010. WASHINGTON, DC, November 25, 2013 (ENS) – Solar, biomass, and wind power provided 99.3 percent of new electrical generating capacity in October, according to the latest “Energy Infrastructure Update” report from the Federal Energy Regulatory Commission’s Office of Energy Projects. Generating capacity is not the same as actual generation of electricity. Actual net electrical generation from renewable energy sources in the United States now totals nearly 13 percent. Twelve new solar units accounted for 504 MW or 72.1 percent of all new electrical generating capacity in October, followed by four biomass units generating 124 MW or 17.7 percent, and two wind units generating 66 MW or 9.4 percent. The balance of new generating capacity in October was provided by oil. Natural gas has dominated 2013 so far with 6,625 MW of new capacity (53.7 percent). For the first 10 months of 2013, renewable energy sources – biomass, geothermal, hydropower, solar, wind – have accounted for a third of all new electrical generating capacity. That is more than the generating capacity provided so far this year by coal (1,543 MW – 12.5 percent), oil (36 MW – 0.3 percent), and nuclear power (0 MW – 0.0 percent) combined. Solar alone accounts for 20.5 percent of new generating capacity (2,528 MW) so far this year, more than doubling its 2012 total. For the first 10 months of 2013, compared to the same period in 2012, new capacity from all sources has declined by 27.5 percent from 17,008 MW to 12,327 MW. Renewable sources now account for nearly 16 percent of total installed U.S. operating generating capacity: water – 8.30 percent, wind – 5.21 percent, biomass – 1.32 percent, solar – 0.59 percent, and geothermal steam – 0.33 percent. This is more than nuclear – 9.22 percent, and oil – 4.06 percent, combined. A second new federal study, the latest issue of “Electric Power Monthly” by the U.S. Energy Information Administration with data through September 30, 2013, notes that renewable energy sources accounted for 12.95 percent net electrical generation for the first three-quarters of 2013 (hydropower – 6.90 percent, wind – 4.03 percent, wood + biomass – 1.40 percent, geothermal – 0.41 percent, solar – 0.21 percent). This represents an increase of 5.22 percent compared to the same period in 2012 with non-hydro renewables combined growing by 15.9 percent. By comparison, electrical generation from all sources, including fossil fuels and nuclear power, dipped by 0.8 percent. DALLAS, Texas, November 25, 2013 (ENS) – A document just made public details U.S. Department of Justice Clean Air Act complaints against Luminant Generating Company for making modifications to two coal-fired power plants that their increased generating capacity without updating permits or installing modern pollution equipment. The previously sealed information comes as part of an enforcement case filed by the Justice Department on behalf of the Environmental Protection Agency against Luminant, a subsidiary of Dallas-based Energy Future Holdings. In August, the Justice Department filed suit in federal court alleging violations of the Clean Air Act at the two power plants. The claims originally were filed “under seal” because of Luminant’s assertions that portions of the government’s case could reveal confidential trade secrets. Last week the Justice Department released a public version of the complaint revealing nearly all of its claims. The Justice Department alleges that Luminant made “major modifications” at its Big Brown and Martin Lake coal plants that increased sulfur dioxide and nitrogen oxide emissions without updating air pollution permits or installing pollution safeguards. Under its New Source Review provisions, the Clean Air Act requires polluters to obtain permits and install modern pollution controls before modifying a coal plant in a way that will increase emissions. The Justice Department and EPA are asking the federal court to order Luminant to install pollution controls at the Martin Lake and Big Brown coal plants and apply for new permits. The agencies are seeking a civil penalty of up to $37,500 per day since the dates of violations, some of which began in 2005. Sulfur dioxide, SO2, can cause respiratory illnesses and trigger asthma attacks. SO2 pollution combines with nitrogen oxide pollution to form soot, or particulate matter, which poses further threats to human health. The Martin Lake and Big Brown coal plants are the largest two sources of SO2 pollution in Texas, and the Martin Lake plant is also the largest source of nitrogen oxides pollution statewide. WASHINGTON, DC, November 25, 2013 (ENS) – The U.S. District Court for the District of Columbia has rejected a motion by the Sierra Club and National Wildlife Federation for an injunction to halt construction of Enbridge’s Flanagan South tar sands pipeline. Judge Ketanji Brown Jackson denied the request earlier this month. In August, the Sierra Club and National Wildlife Federation filed the lawsuit challenging the approval of Enbridge’s Flanagan South tar sands pipeline by the U.S. Army Corps of Engineers and other federal agencies. According to the groups, federal agencies approved the pipeline without any environmental review or even the public notice required by federal law. Flanagan South would transport 600,000 barrels of tar sands crude oil from Flanagan, Illinois to Cushing, Oklahoma through thousands of waterways, communities, drinking water sources and sensitive areas such as wildlife refuges. “The proposed pipeline would cut through some of America’s most iconic waters, including the Mississippi and Missouri Rivers,” said Jim Murphy, senior counsel for the National Wildlife Federation. “A spill would be devastating to wildlife like waterfowl and sturgeon that use these rivers. The extremes dangers tar sands poses need to be thoroughly examined before any decision about this pipeline is made,” Murphy said. Enbridge is the company responsible for the largest oil spill on U.S. soil in 2010, when another of its pipelines spilled 840,000 gallons of heavy tar sands crude into the Kalamazoo River. Three years and $1 billion in cleanup costs later, Enbridge has still not successfully removed all tar sands from the river. Despite Sierra Club’s repeated efforts to review even the most basic information about the proposed pipeline project, including Enbridge’s application materials, the Corps has refused to share them with the public. The Corps denied the Sierra Club’s multiple document requests under the Freedom of Information Act, denials also challenged in this lawsuit. The purpose of the lawsuit is to force the Corps to consider the many environmental risks of this tar sands pipeline, which is nearly as big as the proposed Keystone XL pipeline, before it can be built, said Hayes. Because Flanagan South is not a border-crossing pipeline, it does not require State Department analysis or presidential approval. If President Barack Obama denies a Presidential Permit to TransCanada’s Keystone XL’s northern half, Flanagan South could make up more than half of that pipeline’s capacity, when combined with Enbridge’s proposed expansion of its Alberta Clipper pipeline, approved by the State Department during the Congressional recess in August 2009. NEW YORK, New York, November 25, 2013 (ENS) – Energy Vision, a national non-profit organization that promotes clean, renewable, petroleum-free transportation fuels, presented its annual Energy Leadership Awards to pioneers in the emerging waste-to-fuel at an event Thursday in New York City. The City of Sacramento received its award for the first closed-loop initiative in the continental U.S. converting local food wastes from households, businesses, food processors, and more into a renewable, clean and net carbon-negative fuel, called renewable natural gas, or RNG. The gas is used to power the fleet of Atlas ReFuel trucks hauling the wastes. Clean World, which built the biodigester; BioCNG LLC, which built the gas refinement system; and Clean Energy Fuels, which built the refueling station, shared the honors. The second award went to the Fair Oaks Dairy in Fair Oaks, Indiana, where the manure from the dairy’s 11,500 cows is used to power the 42 long haul tanker trucks which deliver 300,000 gallons of milk a day from these same cows in a three state area. AMP Americas, which put this project together, Greenlane Biogas, which built the gas refinement system and Cummins Westport, which provided the natural gas engines powering the tanker trucks, shared the honors. The “all green” event was co-chaired by Energy Vision Board members Brendan Sexton, a former Commissioner of Sanitation for New York City; photographer and lecturer Joan Pearlman; Energy Vision President Joanna Underwood, and film producer Tom Fontana.